This article originally appeared in Meatpaper Issue Nine. He wasn’t the only one. 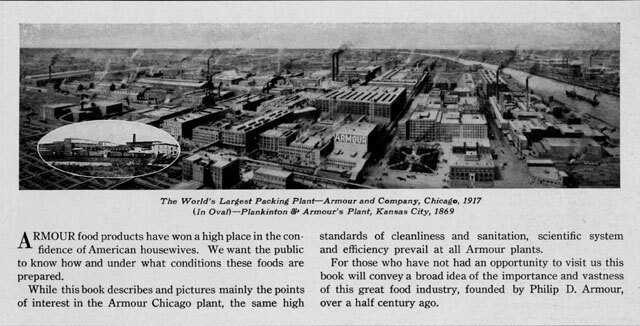 In the early 1900s, 200,000 people visited Armour’s main plant in a single year, among them women’s clubs, church societies, domestic science classes, trained nurses, journalists, scientists, and house-wives’ leagues. When the journalist Upton Sinclair set out to write The Jungle, all the investigative prowess he needed to get inside a slaughterhouse was to sign up for a tour group. 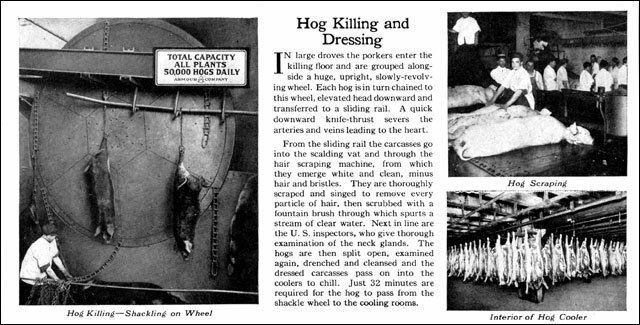 Sinclair’s book shook up the industry and led to the Meat Inspection Act of 1906, but, according to Roger Horowitz, author of the excellent social history Putting Meat on the American Table, the tours didn’t halt until mid-century. Why? Horowitz was kind enough to answer a few of our burning questions about slaughterhouse tourism. So, when did these tours start? The earliest tours we see referred to are in the 1870s. The completion of the Transcontinental Railroad, the invention of the refrigerated railroad car, and a certain amount of political dealmaking were causing the slaughterhouses to consolidate like they never had before. And there was a sense that letting people see what goes on inside the slaughterhouse was good for business. Meatpacking plants would publish pamphlets bragging about how modern and hygienic their facilities were. Visitors would walk right out onto the killing floor and see workers covered in blood, and to us today it wouldn’t look clean, but it was clean compared to what had been going on 10 years earlier, when local butchers would just throw entrails right out into the street. This is the beginning of industrialization. A lot of the industrial economy in the Midwest prior to World War II was devoted to transforming commodities into food: wheat into flour, corn into cornflakes, cows into steaks. There was this sense among people that this is what America is good at. If you want to see American industrialization at its peak, go to a slaughterhouse. Is it true that Henry Ford got the inspiration for the assembly line on one of these tours? He said so in his autobiography. The conveyor belt system was a huge innovation in the slaughterhouses — instead of moving around, the men stood in one place, and the work came to them. In your book, you mention that a lot of women worked in slaughterhouses, too. What did they do? The jobs they took were less dangerous, but also had much lower pay. They appeared with the rise of processed meat in the 1880s and 1890s. Meat is deeply ingrained in American culture, going back to the colonial period. It’s a symbol of American prosperity — Americans could always eat more meat than the Europeans. It was part of democracy to be able to afford meat. Meanwhile, organ meats are a good source of protein, but in America they were always the meat of the poor. So these companies were born that turned organ meats into something else before they reached the consumer. No more tongue. Now there was only Spam. And these are the jobs that women took. Interestingly enough, when sliced-bacon departments were created in the 1910s, they were created in part as a site for tourism. They would glass-in the walls and hire only white, native-born women for that department. There’s no blood with bacon. It’s cured and dried and cut already, so it looks really clean. It was a sign of the changing nature of the tours — this increasing idea that slaughterhouses should actually look clean and bloodless. So jobs were divided by ethnicity as well? The sausage departments were full of immigrant women. There’s a quote in one of Armour’s guides about how the Norse work in refrigeration because they’re adapted to working in the cold, and the Americans are the killers, because killing takes the most skill. The worst jobs went to African Americans — rendering, curing hides. The subtext in how these slaughterhouses were presented on tour was “There are no black hands touching the meat.” But of course there were all kinds of black hands touching the meat — that was just happening in other parts of the slaughterhouse. What happened? Why did the tours come to an end? They closed down for World War II and never reopened. Trucking began to replace the railroad, and they moved the slaughterhouses out to the prairie, where they were closer to the cattle, as opposed to closer to the customer. And the culture had changed. Public sentiment had turned against them. Is it hard to get that kind of access these days? Why do you think these tours were so popular? What is intriguing in descriptions of slaughterhouse tours is the reactions of people going through. There’s a little of that amusement park horror. It’s the same impulse that pushes people to see scary movies. People would go, see their gore. And then they would go home and eat a steak.